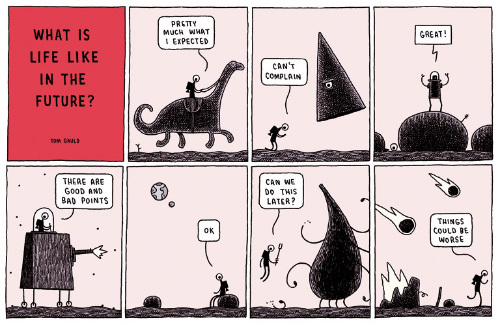 I was an accidental fan of Tom Gauld’s for years, thanks to a book of postcards in the Captain’s library. One day, I discovered he was on flickr, and lo, there was much rejoicing. Gauld packs a ton of humor and humanity into every cartoon and he makes it look so damn easy. Slip on by his flickr stream and wallow in the goodness. Let us, for a moment, disregard the fact that the pole dancing robots have been making the rounds on the internet lately (unfairly called “bonerkillers” at Gizmodo of all places!) or that imploring someone to “Google” something no longer inspires even a half-hearted twitter (or a Twitter for that matter). Let us instead bask in a world where a tiny little piece of metal and plastic sends me a message of such delightful literary brevity from a friend hundreds of miles away with whom I used to sneak nips of Jamesons with while at work (oh give me a break, we were baristas, not bus drivers). If you’re still interested, here’s a link to the abovementioned pole dancing robots. Be warned: the video is overlong, of poor quality and plays some terrible music. Still still interested? “The whole thing is ridiculous. It’s the most ridiculous city in the world – but everyone who lives there knows that. No one thinks that L.A. “works,” or that it’s well-designed, or that it’s perfectly functional, or even that it makes sense to have put it there in the first place; they just think it’s interesting. And they have fun there. Not a single word of this essay is untrue. From the delightfully, functionally futuristic bldgblog. Last week I read an article about an experimental psychological tool for astronauts: a computer. The concept is very, very basic: write a program that walks the user through self-treatment. As I was reading, my first reaction was to dismiss the entire thing – yes, that’s what I’d need if I were depressed, an emotionless checklist presented to me in the form of a computer program (the article is also hilariously quick to insist it would be “nothing like science fiction’s infamous HAL,” because, you know, it’s important to clarify that it won’t kill the crew off). Human psychology is something I make no claims in understanding. When I’m feeling depressed I occasionally think, “Maybe I need help?” since TV tells me I do, but then I realize, “Wait, it’s legitimately depressing to understand that human beings suffer needlessly.” If I’m totally honest with myself, than I have to admit I’d love to ask my computer what I should do about feeling blue. Abulafia¹: What seems to be the problem? me: I feel sad. Well, maybe more like hopeless. Abu: Okay. Can you be more specific? me: I’m tired of being poor and worried about money all the time. Abu: Have you tried getting a job? me: There is no precedence that shows my getting a job will alleviate the problem. Abu: Well… have you tried Googling any news on the Diablo III release? Also, I broke your Photoshop. Sorry. “Depressed astronauts might get computerized solace” at USA Today. ¹I name my computers, yes, and this one is named Abulafia. Sometimes, in the midst of the terror of bureaucracy and Los Angeles parking permit fiascos, a minuscule glimmer of hope shoots by, nearly undetected. You have to be alert. A Hope Neutrino, if you will. You see, I’m afraid you either get it or you don’t. Some of us are chosen, and we know we are chosen. If you are reading this, you’re probably one of us. It usually happens with youth. We all have the story. Just, one night, you heard your name being whispered. Mine was in the Mojave desert, next to Edwards Air Force Base where my grandparents lived. Late one night, far away from light pollution and close to the actual breathing spirit of jetflight itself, Old Muroc, I looked up one night and saw the Milky Way and – I think I must have been about 6 years old – suddenly realized that the sky wasn’t a solid ceiling, but a falling away of infinity. I remember physically losing my balance. It was no longer “up,” it was out. New neurological links fused into permanent brain patterns. The stars did not move across the Earth, the Earth was moving amongst the stars. Each new piece of information was like punching my brain in the stomach: each star was a sun, each sun could have planets circling it, the universe had no known boundary, and suddenly, amongst the static download of data, the understanding of what it meant that we had been out there. We had been out there! I want to. I’m trying. It’s hard for me to admit, but I understand faith. I know what it feels like to have that one thing you don’t need to question, that one thing that doesn’t waver in front of being tired, being sick, being bored and frustrated. It’s just that, instead of believing in a magical, bearded cloud-man, I believe that mankind isn’t as terrestrial as we think we are. Oh, I don’t know that the specific species came from space or anything, but I do know that each atom of our DNA is literally stardust. That everything we are, everything we touch and eat and breathe is stardust, particles travelling billions of lightyears from where they started, particles that saw the beginning of time itself. We are each space. Some of us know we should go back. Earth is a fun diversion, but you can only stay at Disneyland so long. Yesterday it was brought to my attention that SpaceX, the privately held company that put the first civilian-designed and launched rocket into orbit on September 28th (without a damn hitch, I should add), is headquartered in Hawthorne, California. Which is literally within walking distance of where I am typing this right now. As I excitedly perused their site to see if they offered tours of the facility, I absentmindedly clicked on the “careers” page, where I happened to notice they were hiring for a position I am qualified for. 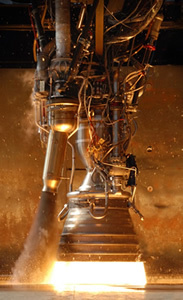 The SpaceX Merlin rocket engine (no relation, I assume, to the other famous Merlin engine). Photo ©Space Exploration Technologies. It feels dramatic, but it is true: it was like being back in the desert again, the gossamer rip of the Milky Way forever obliterating my view of the universe. I could work for a company that puts rockets into space? Oh. Oh my. All this moving horror, the complex series of phone calls it takes to get one’s gas service turned on (it’s a long story, but suffice to say that even customer service was confused), all that flotsam was slammed back into place. All of these companies, and there are more every day it seems, are staffed by people, private, educated, passionate people – regular people – who want nothing more than to get us home. It is their job. SpaceX has no government coffer (hell, our government doesn’t have a government coffer), no politcal agenda. It’s pure science, every day. It is a moon landing, every day. And I intend to participate. I just hope they’re okay with me having a tattoo of SpaceShipOne in my left armpit. This morning a comment was left by Dr. Chris Lintott, astrophysicist. ASTROPHYSICIST. Oh, I am squirming with delight right now. And seriously, if that isn’t awesome enough, he co-wrote the book Bang! The Complete History of the Universe with Brian May – yes, THE LEAD GUITARIST OF QUEEN, WHO IS ALSO AN ASTROPHYSICIST. Buckaroo Bonzai naysayers can stuff it! In February of this year I wrote an offhand snippet about my adoration of the science fiction movie Sunshine that included a few one-liners aimed at Dr. Lintott. He had been consulted as an astronomer to comment on the movie, and I used his quotes in my own post. Today Halcyon wrote a response to Dr. Lintott that I wanted to publish it here as a front-page post rather than a comment (both due to its length and my continuing interest in the subject). I am thankful that Dr. Lintott felt comfortable responding to my previous post here at GalacticMu, and I hope that he forgives us for responding on our own turf like this. Dr. Lintott, it is truly an honor. Thank you for stopping by our humble blogship. I’m sad to say you seem to be arguing around the point of Captain Sunday’s post. There is a larger context here, which is explored thoroughly in a newer post. Here’s the gist: our community, the science fiction community, has taken an ugly turn toward realism… mundane fiction, as Sunday calls it. Part of the reason for this shift is that scifi authors have suddenly become quite concerned with what real scientists think of their work. Plausibility is running roughshod over imagination. Many of SF’s greatest works completely ignore one or more fundamental laws of physics. Take “Fantastic Voyage” for example. The physics are preposterous. That’s a given, part of the contract Asimov makes with the reader at the beginning of the book. Everyone knows it’s impossible to shrink a human being down to the size of a blood vessel, but what if you could shrink a human down to the size of a blood vessel? How cool would that be? How many future scientists and doctors were inspired by that book (and the movie)? And what do you want to bet that Fantastic Voyage was the inspiration (directly or indirectly) behind today’s endoscopes? How about the camera-pill? Scientific discoveries (and theories) inspire science fiction. Likewise, SF can and has inspired scientists. This reciprocity of inspiration is healthy. But it is lost when scientists take fiction too seriously and when authors (and auteurs) take scientists too seriously. When SF creators become too concerned with how (as in: “how does this spaceship have artificial gravity”), they wind up sacrificing the what-if. SF becomes devoid of entertainment and inspiration, as dry as a scientific journal. A little suspension-of-disbelief is a small price to pay for a movie as beautiful as Sunshine. Besides which, suspension-of-disbelief is good for you. It’s a healthy part of a scientist’s diet. Because almost everything you know to be scientifically valid would have been considered complete rubbish by scientists like yourself 100 years ago. And every new theory starts with someone suspending his or her disbelief about how our world works. The official Bang! The Complete History of the Universe website.